Earlier this week, we put out a call in Shopify Entrepreneurs for submissions to Roast my Store. The idea was to find store owners wanting to have their stores reviewed in a Live on Facebook. That Live is still happening. You can attend it here. Our expert Steven Hudspith reached out to me volunteering to review some of the submissions ahead of time, and I obviously thought it was a great idea! So without further ado, here are the four stores and Steven’s expert opinions. 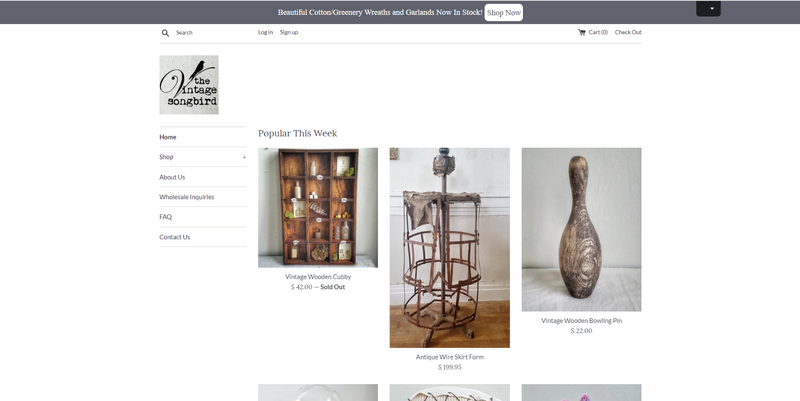 The Vintage Song Bird sells unique handcrafted farmhouse decor & authentic vintage pieces to add a beautiful rustic farmhouse feel to your home. First impression is: what is this site about? It’s not clear and should tell the viewer within a millisecond of arriving what its is all about. Top header bar should be used for something better like a free shipping announcement and the box with an arrow should be removed. Ok, I want to buy something, were do you ship to? This is a vital part of an eCommerce site and not having pages like this and Term & Conditions, Returns, Contact details etc will hamper your conversion rate. Product images should be the same size. Right now they look messy on the home page. Too much white space on homepage to the right of the logo which would look better in the center. Product page also has white space under the social share buttons and should have the product description here which is below the thumbnail images. The “recommended for you” app takes you straight to the cart page which should not happen. If I need to buy other products, this would be really annoying. The Our Story image would look better on your About page. Being able to see you is a great trust point as people know who’s behind the site. I would recommend adding an email address (not a Gmail but a proper business one) and your business address plus telephone number if possible as this is a great trust point and is better than those tacky ones you normally see on most Shopify sites. Our meals are gluten free, dairy free and soy free. We use only grass-fed & free range meats. 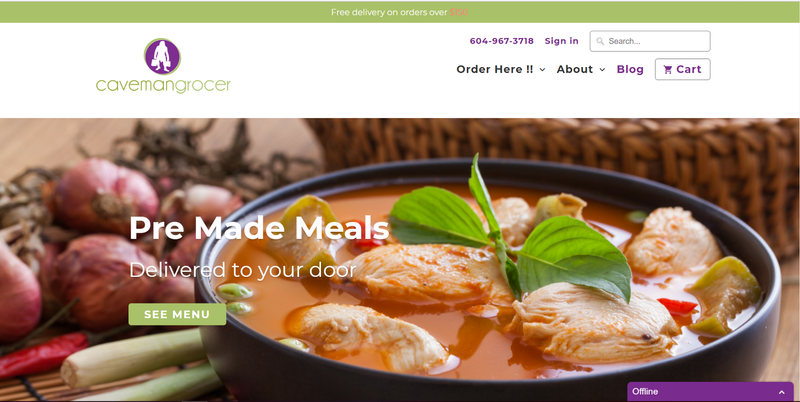 We deliver to Vancouver, Sea to Sky and all of the Lower Mainland. Pop up comes up too quick and should wait until I have had a chance to view your site, then if I like what I see I’m more likely to sign up. Free delivery bar is hard to read, changing the colour to black or white would be good. A bit nit-picky but the “How it works” section should start with capitals. I click on all meals and the first two things I see is a gift card and a cooler deposit, it would be better to take me to a collection page of just meal types. Headings are a bit big on collection pages and product titles. Your only size options are Jurassic or Classic, it would be better to tell me the weight or the number of servings for each size. The “Add to cart” button would be better in anther colour to stand out. The “About” link in the header and the footer both take you to the homepage, check all your links to make sure that they work. Remove the eCommerce Software by Shopify in footer. 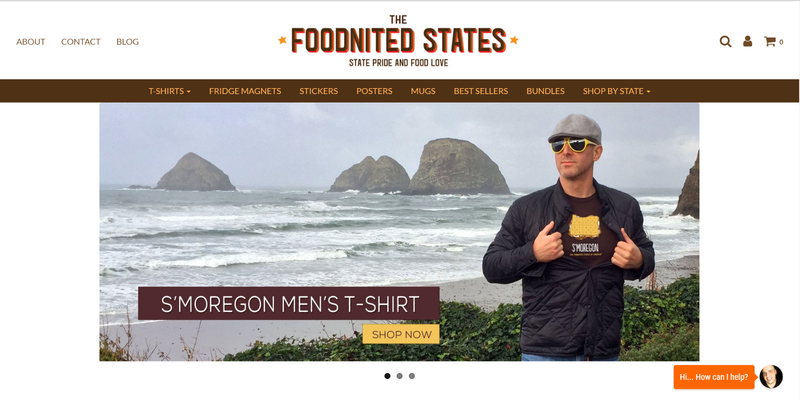 Foodnited States is all about Pride and Food Puns. They sell t-shirts, fridge magnets, posters and stickers with U.S. States made of food and renamed accordingly. Again not 100% sure what this site is selling from the first glance. Pop up comes up to quick and should let me browse first. Footer has a bit of space under the contact us bit, how about an address, email and the telephone number there. About page could do with more content, its surprising how many people will view this page. Blog page only shows three articles at a time. You also have to scroll a long way down to click next. I would remove best sellers from menu and just have the homepage bit. You ship worldwide and the Get Five Bucks For The Fourth is not GDPR-friendly. The headings on the collection pages could be a bit bigger. Recently viewed products is a great thing to add to the product page as it reminds me of what I has just seen. Reorganize your FAQ page with the more important details at the top. Adventure-based brand. We follow our passion for the great outdoors and make the best quality products that will outlast your adventures. Escape often. The chat feature is annoying. It distracts from the site and should close once I scroll. Menu needs to be tidied up, remove home. The shop drop-down is not what you would expect. Add to basket doesn’t stand out if no size selected and should. Big space in footer and I would have the payment icons bigger. The bullet points on the product pages would be better below the add to cart. The header is a bit big and pushes the page down which affects the product page as most of the content should be above the fold. Site needs to use the green one the add to cart button more often in the site than just the blue.